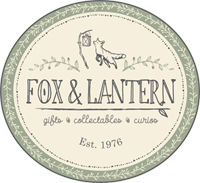 Fox & Lantern is a small online family business based in West Yorkshire. We pride ourselves on selling excellent quality products and great brand names to our customers! We like to specialise in the quirky and wonderful gifts that you don’t see everyday, so we really hope you find plenty of inspiration amongst our collection! Customer experience is really important to us, so If you need any help please do not hesitate to contact us - or leave a message and we will get back to you as soon as we can. 9.00 am - 5.30 pm Monday - Saturday.